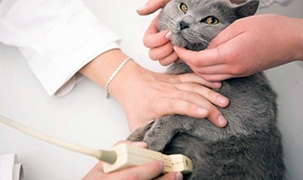 Our team of skilled doctors excels in diagnosing and treating the medical conditions of dogs and cats. By using state-of-the-art techniques and equipment, the cause of common problems such as fever, poor appetite, weight loss, respiratory distress, vomiting/diarrhea, anemia and other bleeding disorders, shock, organ failure, abdominal distension or discomfort, and urinary abnormalities can be identified and managed. Commonly used diagnostic aids include endoscopy, ultrasound, special radiographic procedures, blood testing, and specialized sample collections. We constantly search for and employ more effective and less invasive procedures to diagnose and treat our patients’ diseases. If your pet is suffering from an infection, injury, toxicity, immune dysfunction, or cancer, doctors have the training and experience to identify these conditions quickly. Timely treatment of your pet’s illness will ensure that your pet has the best opportunity to regain his or her health. Intravenous fluid support, nutritional support and specific medical treatments are available to treat your pet. A dedicated and compassionate nursing staff ensures that your pet is comfortable.